An Air National Guardsman was the second ever to graduate from the U.S. Navy Fighter Weapons School (TOPGUN), Dec 15, 2017 at Naval Air Station Fallon, Nevada. JOINT BASE LEWIS-MCCHORD, Wash. -- Washington Air National Guard members met at the American Lake Conference Center on Joint Base Lewis-McChord for the 9th Annual Washington Air National Guard Awards Banquet Jan. 27. Senior leadership and search and rescue (SAR) experts from the U.S. Coast Guard 13th District received an orientation visit at the Western Air Defense Sector today. The U.S. Coast Guard SAR experts conducted a cross-talk where lessons learned from the Western Air Defense Sector’s involvement in Hurricane Harvey recovery efforts were discussed and future ways the two organizations can better work together during future SAR events. Community partners and Airmen from the Western Air Defense Sector participate in the 8th annual Operation Turkey Drop Nov. 16, 2017. Operation Turkey Drop helps ease financial burdens of holiday expenses for Airmen and Soldiers on Joint Base Lewis-McChord and Camp Murray. 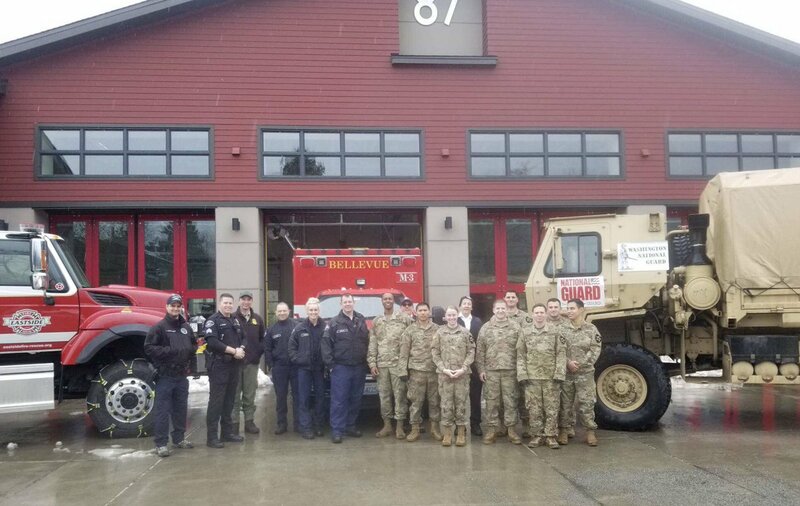 The event is made possible by the Association of the United States Army, the Air Force Association and Pierce Military and Business Alliance and dozens of local businesses and organizations. The Canadian Detachment of the Western Air Defense Sector participated in the 20th Veterans Day program at the Tahoma National Cemetery Nov. 11 in Kent, Wash.
A Washington Air National Guardsman assigned to the Western Air Defense Sector deployed in his civilian job capacity using his military training expertise to support Hurricane Maria relief efforts in Puerto Rico during the first two weeks of October. The Canadian Detachment at Joint Base Lewis-McChord had a very successful first inning of the JBLM Can-Am Challenge Cup softball game Oct. 6 at Baker Field on McChord Field. After five runs scored, Keith Spilley suggested loudly from Canada’s dugout that the game be called due to weather. Three members of the Western Air Defense Sector’s 225th Air Defense Squadron travelled to Guatemala in August to provide air defense expertise to the Guatemalan Air Force. Aaron Boone, a finance specialist for the Western Air Defense Sector, was recognized as an American Red Cross Hometown Hero Sept. 28 by the American Red Cross Association Northwest Region for his donation of blood platelets 26 times over a 15-month period.